Harajuku, like Tokyo itself, has something of a split personality. 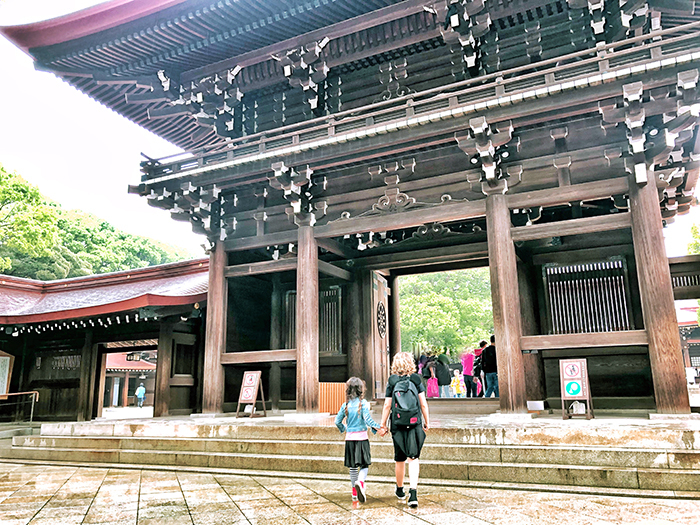 Serene and extreme all at once, the area is home to one of Tokyo’s most important Shinto shrine as well as the city’s most out there shopping strips. 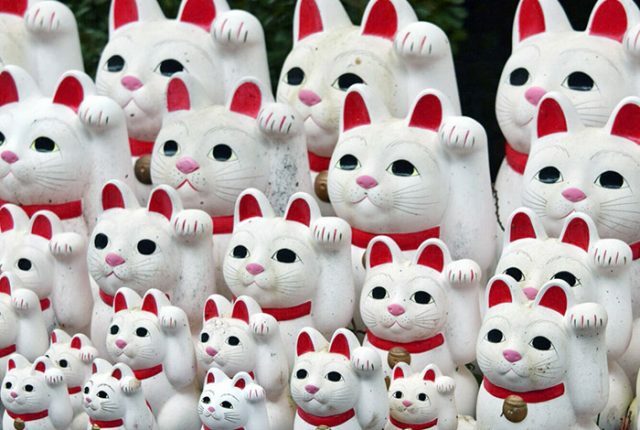 In fact, Harauku is in itself a shrine… to conspicuous consumption. 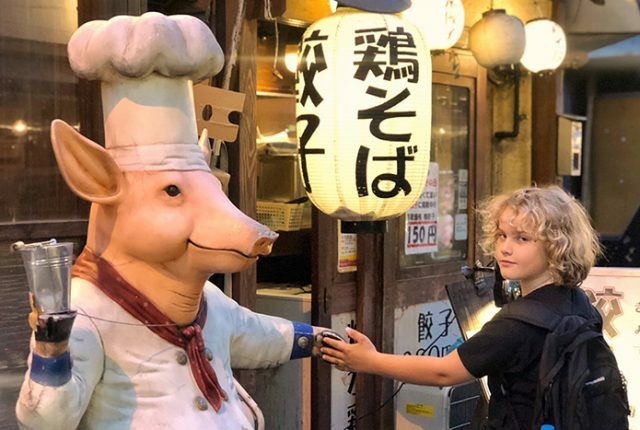 Only in Harajuku would you spot an outrageously dressed cosplay teen outside Hermes, because even its parallel shopping streets have that Tokyo yin yang about them. Tree-lined Omotesando is Tokyo’s answer to the Champs-Elysees, lined with upmarket designer boutiques and swanky cafes. 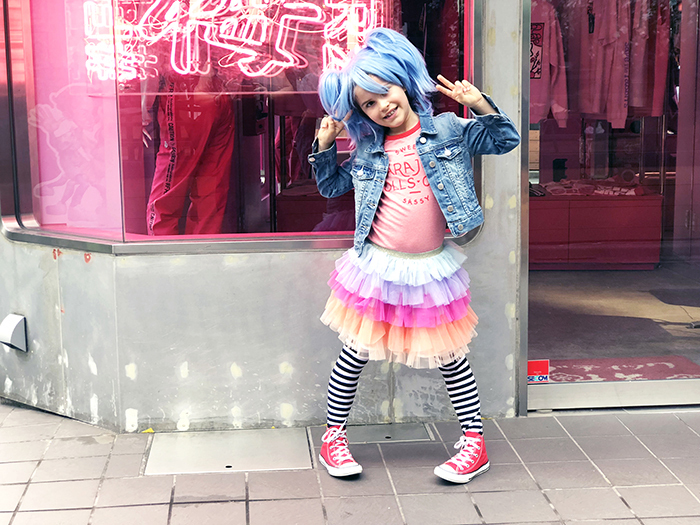 It’s out of our budget so we head instead to Takeshita Dori, the hub of Japanese teenage culture, packed with quirky boutique fashion, second hand clothes and a rainbow of kawaii sugary delights, and exploring its length is one of the best things to do in Harajuku with kids in tow. 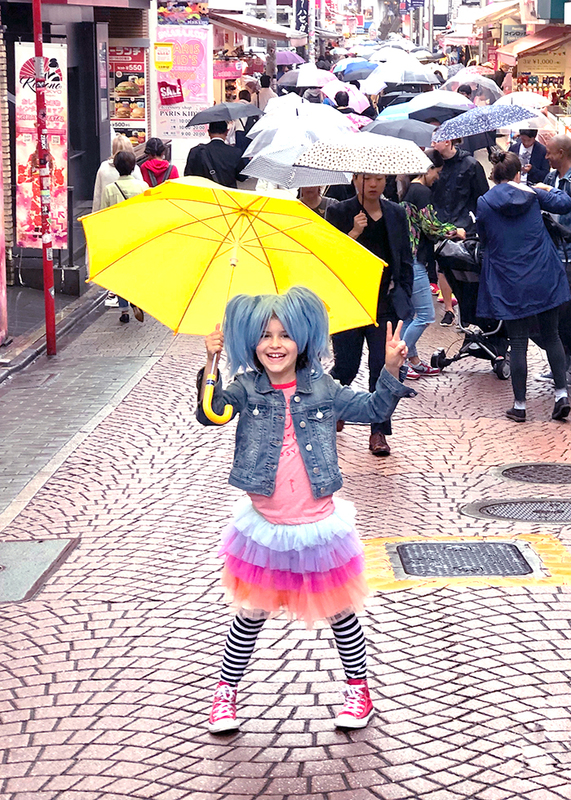 One of Tokyo’s busiest, and brightest streets, Takeshita Dori is also a portal to the world of Japanese kawaii (cute) culture, something my littlest loon embraces with an abundance of enthusiasm. 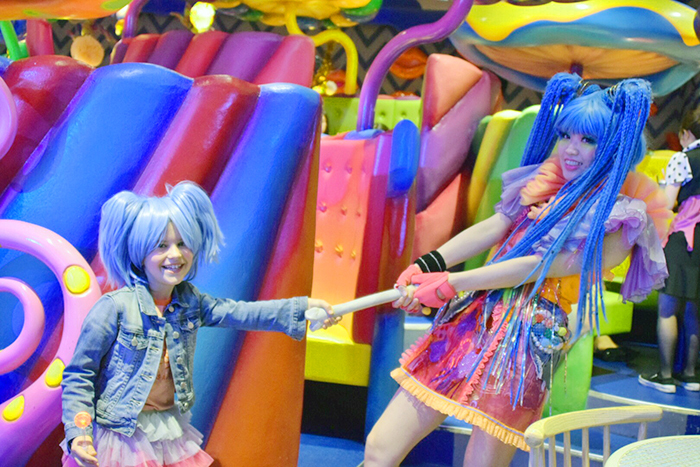 It’s the place to spot crazily costumed Cosplay kids, Goth Lolitas and candy-haired teens dolled up in their pastel ruffles, although they’re few and far between on a weekday morning. 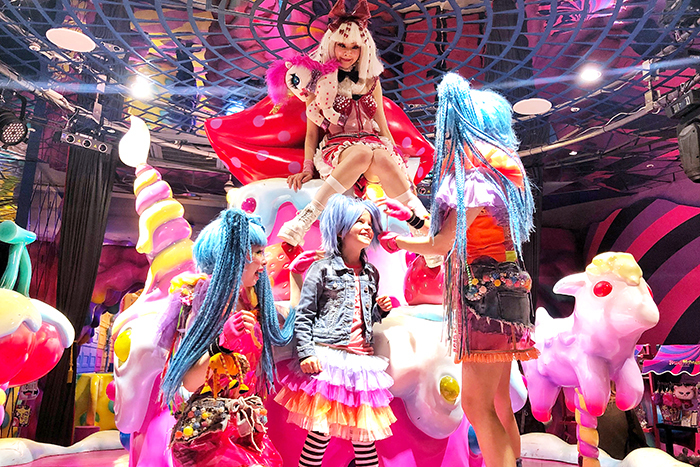 But we bring our own BYO Harajuku girl who has decided to add an extra splash of colour to the already rainbow-hued strip with her own ruffles. 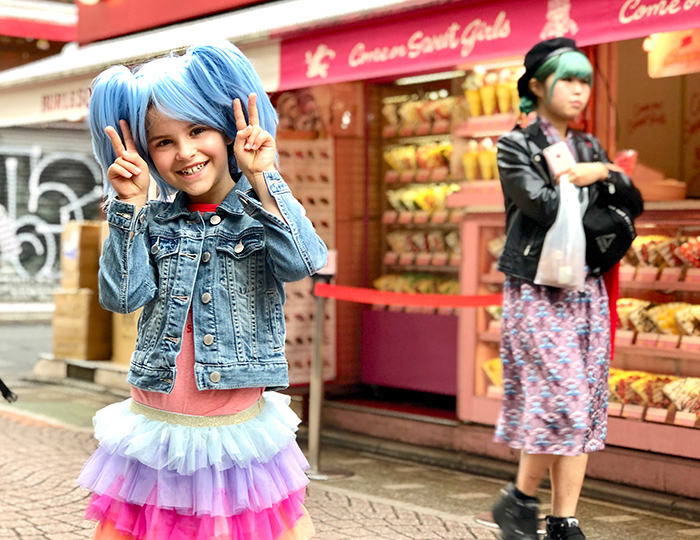 The kids have visited Harajuku before, but a visit here was number one on Sugarpuff’s Tokyo hit list and she carefully planned what she was wearing before we even left home, deciding to fully embrace the rainbow-hued kawaii culture, right down to cosplay blue hair. 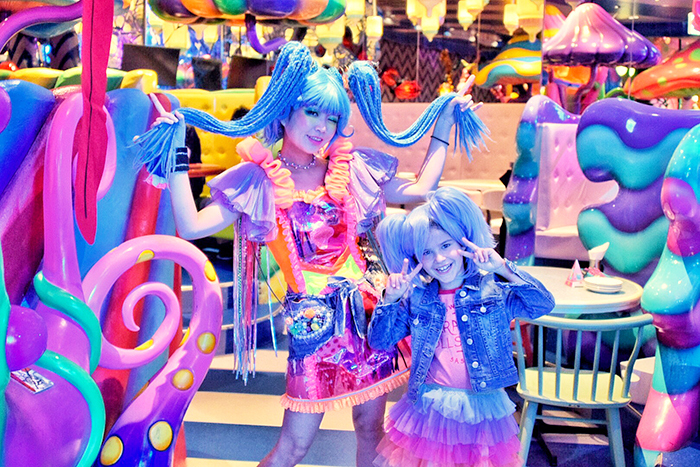 The little loon proves a huge hit with the locals as she struts her colourful stuff. She stops to munch on a rainbow cheese sandwich, wicked waffles and a planet-sized puff of sugar! 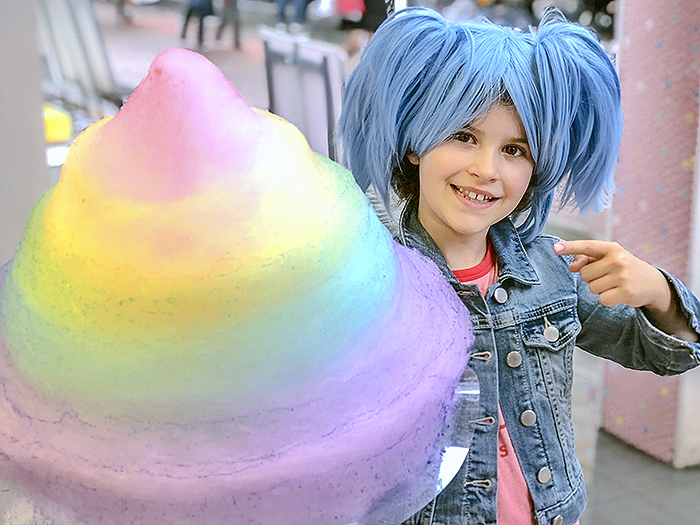 The wata-ame (fairy floss) is so freaking big I’m surprised it doesn’t have a moon orbiting it! Consuming one of these rainbow hued beauties is a Tokyo with kids must! 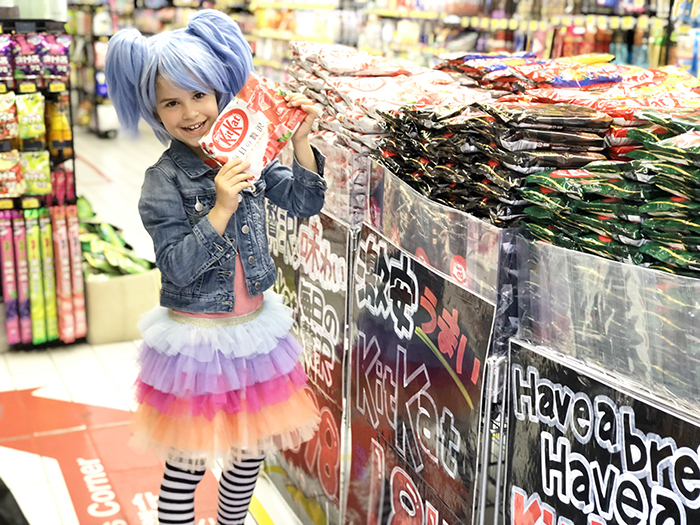 Despite it’s size, it is quickly devoured and my blue-haired baby continues to bounce her way down Takeshita Street on a sugar-dusted high, stopping only for selfies with strangers and to stock up on every flavour of Kit-Kats. 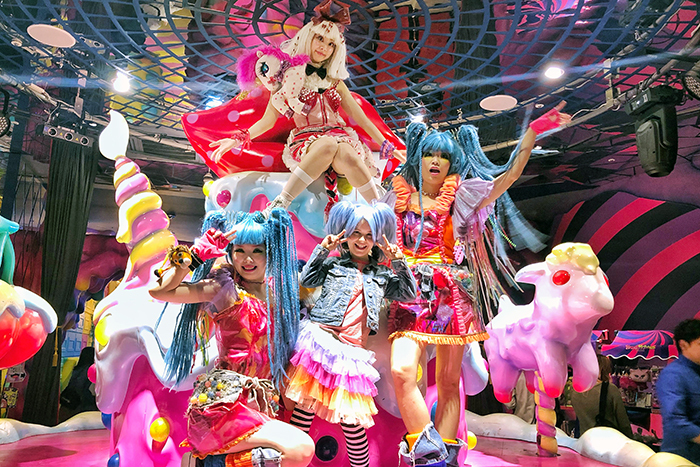 That is until we reach kitsch central, the Kawaii Monster Café. Like Robot Restaurant before it, my initial impression on entering the ocular onslaught that is the Kawaii Monster Cafe is that the psychedelic paint covering floor, walls, ceiling, and every available surface between, is so dangerously retina searing that it could be defined as torture under UN conventions. 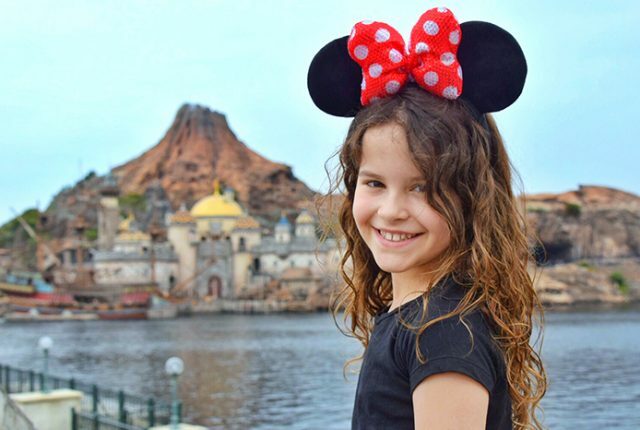 But it’s also one of the funnest things to do in Tokyo. We’re seated in the Milk Stand where our eyes dart between the dangling bottle-fed unicorns and psychedelic mushrooms when a high-pitched voice starts squealing “Kawaii baby monster”. We’re looking around for what’s causing all the excitement when a blue haired “Monster” rushes across and envelops Sugarpuff into her arms. Turns out that my girl is the baby monster, and in a strange twist of coincidence is dressed like a seven-year old version of monster hostess Candy. To twist our melons even further, another colour co-ordinated Candy rocks up and spirits my “baby-monster” away. It occurs to me I may be suffering from an acid flashback. Given I’ve never actually had acid, it seems more likely that Willy Wonka has been free-basing psychotropics. Especially when our food arrives. It’s as brain bending as everything else in the place. I have to say the food here is not cheap and we are obligated to purchase at least one meal and one drink per person, as well as a paying a cover charge. 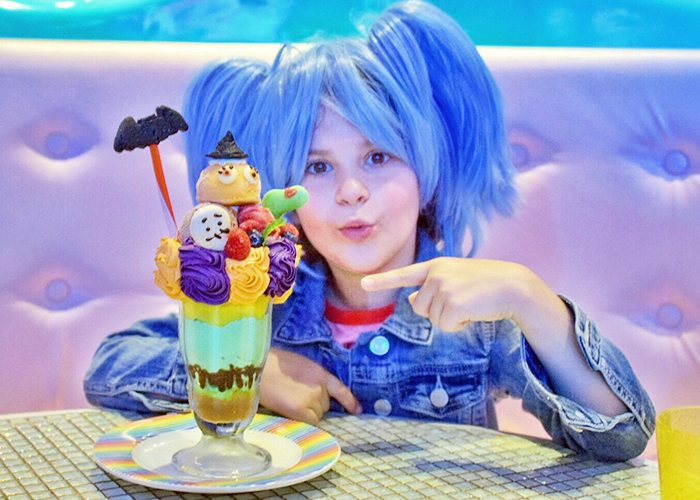 We dine on ridiculous blue burgers, crazy-arse freak shakes and a rainbow-hued parfait that looks like it’s been puked on by a unicorn. It’s ok, but really doesn’t compare to other cheaper meals we’ve eaten in Tokyo. Just when we’re getting ready to pay the bill, a Candy scoops up Sugarpuff and plants her on top of a giant spinning carousel cake. Somehow she’s been roped in to the show. 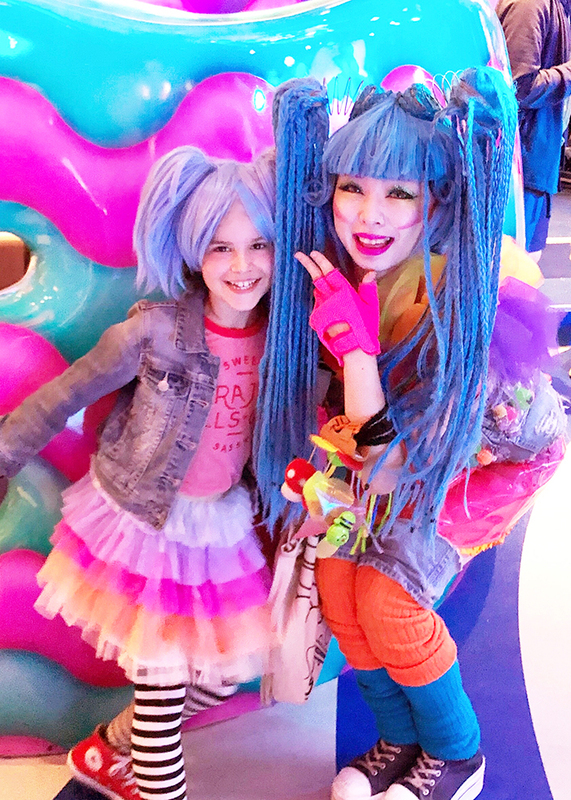 I am baffled and have no idea what’s going on or what the show is even supposed to be about, if anything at all, but my blue-haired baby doesn’t care a jot, happy to sing and dance with the Candy twins and a random bone monster. 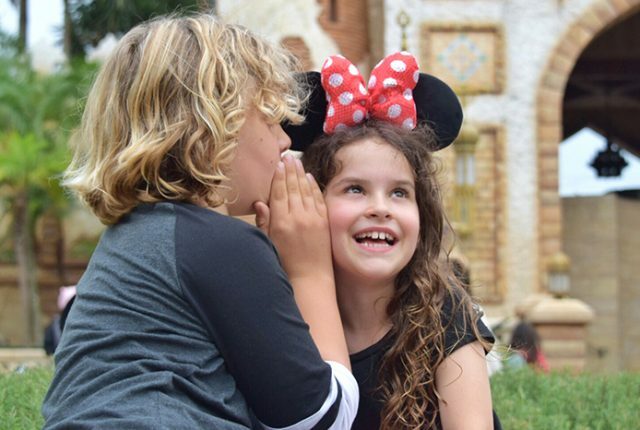 When we finally head back out into the world, my newly minted monster can’t stop singing their song, “ra ra, ra ra, ichi, ni, ra ra” on loop and I consider booking myself into therapy. 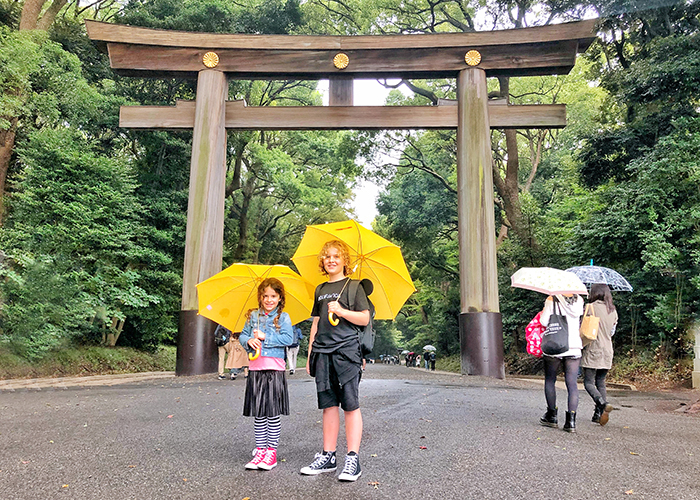 Instead of going the therapy route, I drag the kids across the street through a torii gate, along a long path lined by towering cedar trees into Meiji Jinku, one of Tokyo’s most important shrines. 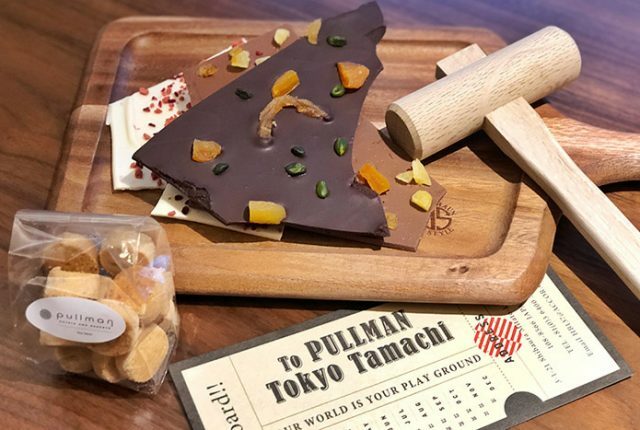 Surrounded by a dense evergreen forest, it’s a pretty pocket of calm that punctures the crazy bubble of Takeshita with ethereal shards of zen. After the clashing colours and chaos of Monster Cafe, it’s like downing a spiritual G&T, and I feel an immediate calm. Surrounded by around 120,000 trees and the sound of chirping birds, it’s hard to believe we’re smack in the middle of two of Tokyo’s busiest districts. We stroll on until we reach the shrine gate. Following shrine etiquette, we wash our hands at the chozuya (cleansing station) using the ladle to wash first one hand and then the other. Then we head through the stunning Kita-mon gate into the inner shrine grounds. Our timing is perfect as we catch a glimpse of a traditional Shinto wedding procession heading into the main hall. 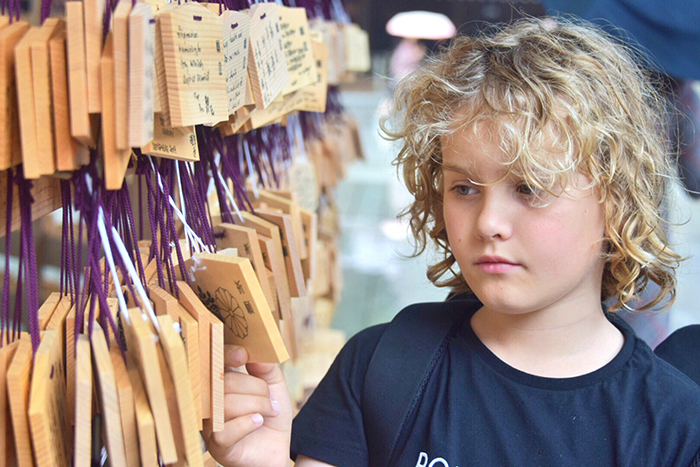 We spend some time in quiet reflection and scrawl wishes on ema tablets to hang on the wishing wall surrounding a sacred tree. The reverential silence is broken only by a sudden chorus of “ra ra, ra ra, ichi, ni, ra ra” as my children, ever on a quest to smash serenity to smithereens, decide to kill it with fire and dance on its grave. But hey, it was nice while it lasted.